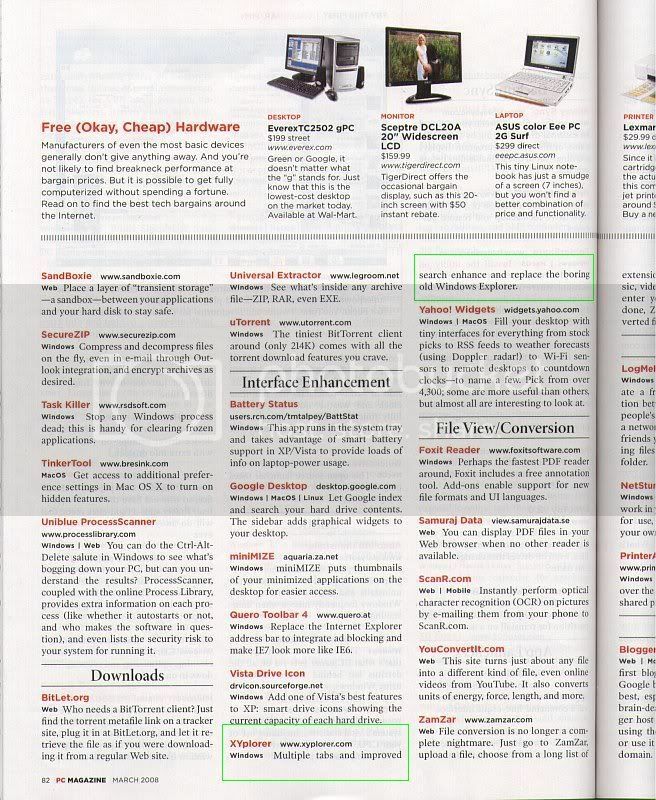 I just got my PC Magazine for March 2008 in the mail, and in the article "Best Free Software - 157 Hot Apps", ...on page 82, it has...XYplorer!!!!!! Listed under category of "Interface Enhancement" with Google Desktop, Yahoo Widgets, and a few others, it's the ONLY WinExpl style app listed! So..maybe my pushing it to Neil Rubenking finally worked! I'm only a power user who was maybe responsible for the publicity, and so you know, the prior pointer to "free" page was removed from site (as I recall/understand it) due to some problems with free users requesting email tech support which is limited to paid users...however, we will GLADLY help ANY user here! And hope that by doing so will encourage you to join the paid ranks! So as much of a pain that free users can be sometimes, getting even this in print is, I think, a major coup! This mag has, I believe, a print distribution of 500K+...and...being in actual print may mean : we can more likely get back in WikiPedia? Last edited by j_c_hallgren on 16 Feb 2008 10:19, edited 3 times in total. Still spending WAY TOO much time here! But it's such a pleasure helping XY be a treasure! (XP on laptop with touchpad and thus NO mouse!) Using latest beta vers when possible. To which page are they linking in the article? To the main homepage? I'll scan the page and email it to Don sometime today..
Addendum: I may try and put a link here also.. Brilliant and well done - I think the addition of scripting and how I guess it will develop takes XY into a new league with loads of opportunity for mention in publications. If scripting is enhanced in the future to make it easy to construct powerful scripts then this could be the way in. XYplorer with 3D scripting, read all about it. I've now also added a "Special Publicity Note" in my blog about this, with link, as another aid for new visitors to locate the appropriate web page. j_c_hallgren wrote: I've now also added a "Special Publicity Note" in my blog about this, with link, as another aid for new visitors to locate the appropriate web page. Needless to say I'm very pleased with this printed notability booster. Let's see if somebody actually reads it. If they really kick out 800,000 copies the chances are good. And I would definitely consider taking advantage of this to update the site to acknowledge this mention and maybe even somewhat welcome those type of visitors, plus make free DL page slightly visible...not really out front, but not really hidden either....and also point out how much as changed since that vers, etc. Maybe they just never updated the main issue page...anyway, I'm after them to fix it now...better late than never! With the imminent release of scripting there is a superb opportunity for mag. articles to introduce this feature especially with the 'Tour' as a pdf download or link. * XYPlorer file management powers ahead! This is why I think the Tour is so valuable as it provides a ready made article for editors to fill their pages and scripting is the vehicle to give it some real added interest. My engineering web site articles are currently being published in the Model Engineer mag - the editor approached me as he needed material and liked the fact all the work had been done! Just hope they pay me, though in my case it is a hobby all is free.